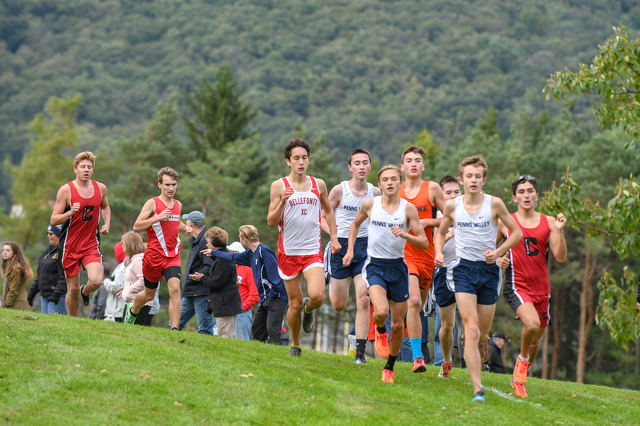 In the PIAA District 6 championships on Oct. 27 in Reedsville, both the State High girls’ and boys’ cross-country teams won the AAA races, while the Penns Valley boys’ team took the top overall finish in the A division. In terms of individual winners, St. Joseph's Sera Mazza, Penns Valley’s Brendan Colwell and State High’s Kileigh Kline each won their respective races. Colwell’s winning time of 17:03 led the Rams to their fifth-consecutive District 6 title. Fellow sophomore teammate Colton Sands was Penns Valley’s next-best finisher with a time of 17:50. Aside from Colwell and Sands, Alexander Gretok (7) and Daniel Kelly (10) finished in the top 10 for Penns Valley. The Lady Rams’ team finished fourth overall with 143 points. Sophomore Kelsey Hull was the teams’ top-finisher, posting a time of 21:00. Karly Smith finished 16th and Danielle Fetterolf came in at 25th. Senior Sera Mazza captured a District 6 Class A district title and led the Wolves to a second-place overall finish by posting a time of 20:08. St. Joe’s had three more finishes in the top 15. Lindsey Carmack placed 10th with a time of 21:47, Kathleen Simons followed Carmack by finishing 11th and Kate Youngmark placed 13th. The boys’ team was led by junior Carter Kauffman’s second-place finish at 17:27. Freshman Josh Hershbine was the team’s next-best runner at fifth-place with a time of 18:05. Lady Red Raider sophomore Amaya Rothrock was the girls’ team best finisher at 12th with time of 22:19 during the Class A championships. Teammate Mia Elmore placed just behind Rothrock at 22:24, good enough for 14th place. The girls’ team finished fourth overall. The boys’ team placed ninth overall. Sophomore Austin Melius finished 12th and led the team with a time of 18:17. Other notable finishes for Bellefonte included Eric Bennett’s 35th overall finish and Jonathan Decker in 51st place. Caleb Spackman placed 70th with a time of 21:43 and Luke Wilson placed 72nd at 22:07 for the boys’ team. In the girls’ race, Caitlin Taylor placed 44th, with a time of 26:19, and Lindsey Reynolds placed 65th. The girls’ team finished ninth overall behind junior Sam Bainey’s 26th-place time of 23:29. Natalie Shaw placed 37th with a time of 24:51 and Megan Kosut took 49th place at 26:44. P-O’s boys’ team grabbed an 11th-place finish thanks to Josh Rea’s 33rd-place time of 19:40 and Scott Frantz’s 36th-place finish. Matthew Thomas rounded out the scoring for the Mounties with a time of 22:16. Both teams finished first in the district title race. The girls’ team had the top six finishes in the race. After Kileigh Kane’s winning-time of 19:17, there were five consecutive Lady Little Lions on the scorecard — Jordan Reed, Emma Simon, Lizzie Gilpatrick, Mihreet Strauss, Molly Solo and Elly Haushalter. The boys got their top finish from senior Owen Isham’s third-place finish with a time of 16:55. After Isham, the next four finishers all belonged to State High. Joe Messner, Ben St. Pierre and Brady Bigger all rounded out the top six in the race. Henry Ballard also helped out with an eighth-place finish.